That means it’s downhill into the weekend and I’m alright with that! As much as I love short work weeks following a long weekend, this one truly feels like we’re cramming 5 days worth of work into 4 and I’m ready for a little mini getaway! So I impulse bought a Groupon deal for two nights at a Napa resort and can’t wait to use it and need to soon! Perfect since I could use a change of scenery and wine tasting. :-) Anyway, back to WIAW! Breakfast: Yeah, I know, another smoothie picture. But they just work for week morning breakfasts for me since my stomach is hardly awake when I leave the house at 7 AM. 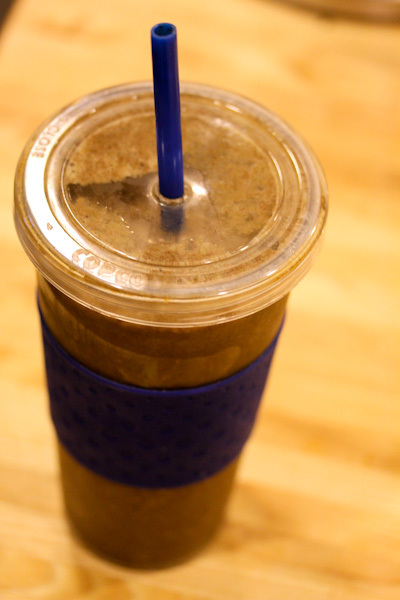 This one had hemp protein powder, spirulina powder, spinach, carrots, frozen banana chunks, and frozen berries. 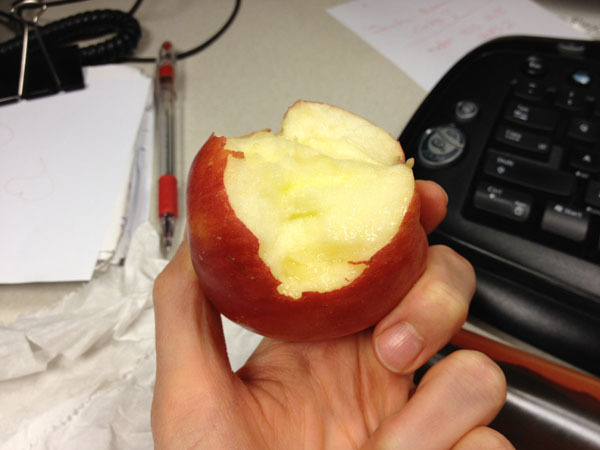 Snack: An apple at my desk, I’ve been heading to work a lot lately with a purse full of fruit. Lunch: I remixed the plain steamed rice leftovers from our Thai takeout by stir frying it in a little olive oil and tamari and adding a mixture of frozen and fresh veggies that needed to be used up with a dash of ginger and garlic powder. 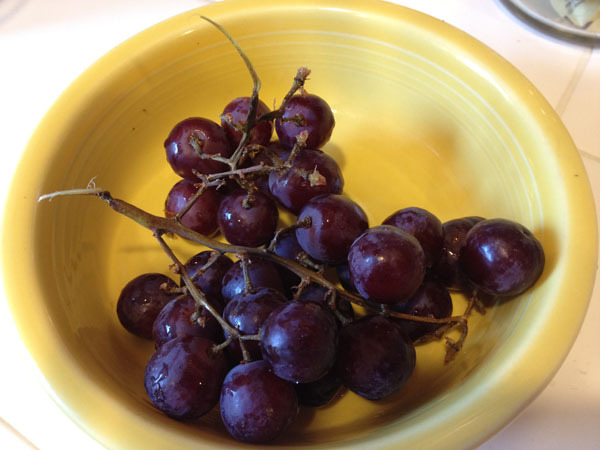 And chased it with a bowl of fresh grapes. 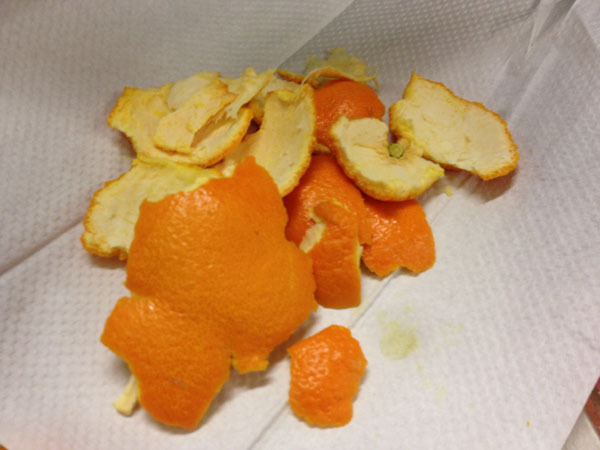 Snack: An interesting orange at my desk that was a grapefruit hybrid, the insides were slightly pink and had a mild grapefruit flavor and very good. 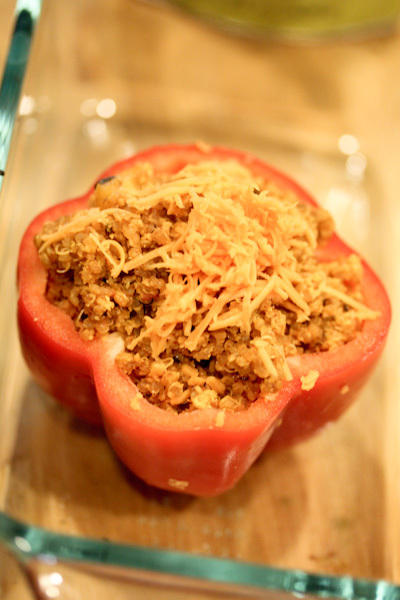 Dinner: I got creative with the Spanish quinoa leftovers from last night mixing in nutritional yeast and shredded Follow Your Heart Vegan Gourmet shredded cheddar, then stuffing into a red bell pepper and baked at 350 degrees for about 30 minutes. HAVE FUN in Napa! You so deserve it..the scenery, the getaway, and of course, the wine tasting. I know you’ll have a blast. 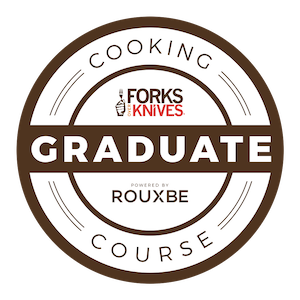 And crunchy leeks, crunchy grapes, they both look perfect. YUM! 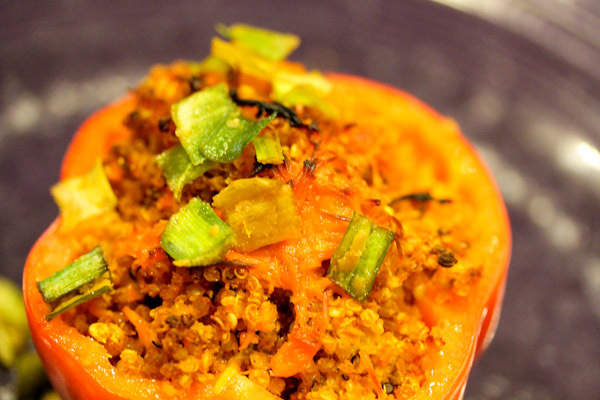 I am totally making the red bell pepper phenomenon tomorrow night — too yummy & easy not to! 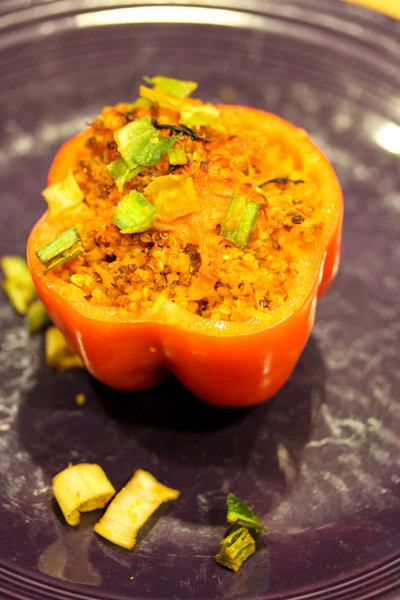 I’ve been having fun experimenting with raw and cooked vegan stuffed peppers lately, so many flavor combo possibilities! Ooooh, so jealous of your getaway!!! Have so much fun! My goodness I love your entire day of food…a great use of leftovers. Thanks, I’ve been trying to save money by being resourceful with them. Your lunch looks really delicious and really thrifty too! 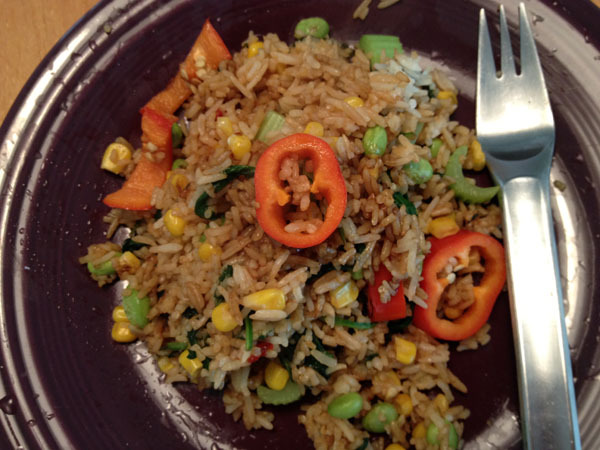 Thanks, it was fun because it’s been ages since I’ve have fried rice.